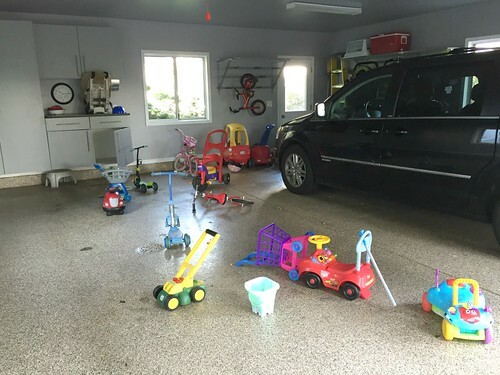 Since my kids and I are in our home for the vast majority of our days, it’s important to me for things inside our home to be relatively neat, clean, organized, and decluttered. 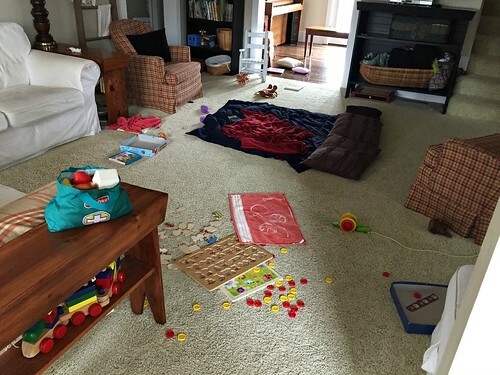 This does NOT mean my kids can’t make a mess playing with their toys, pulling all the books off the shelf to find the one they wanted, or getting out mountains of art supplies to complete a certain craft project. If I really had to estimate how much time I spend keeping my home clean and organized enough for my family and I to feel comfortable and happy living here, it would be fairly minimal. In fact, the more I’ve thought about this over the past few years, the more I realized I basically utilize 3 simple daily routines to manage the inside of my home. ***The boys take a while to eat breakfast (they chat and giggle with each other — it’s very cute! ), so I usually pick one household chore to do every morning while they finish breakfast, as Clara is usually still sleeping. Of course, there are days or weeks when I do more deep cleaning or a post-vacation laundry marathon… but for the most part, these 3 daily routines allow me to keep our house clean enough, organized enough, decluttered enough, and simplified enough for me to feel comfortable living here. Thinking through these routines has also helped me to realize how little time it actually takes for me to keep our home clean and organized enough — it’s just a few minutes here and a few minutes there. I don’t have to spend hours and hours to keep our home neat and clean… so I don’t need to make silly excuses like “I don’t have the time”! If you’d like to get your home a bit neater, cleaner, or more organized, I’d suggest thinking through your day and setting up a few quick routines throughout the day (at convenient times for you). Do your kids sleep in later than you or go to be earlier? Can you work something in during those times? Do your kids get on the bus before you leave for work? If so, challenge yourself to do one thing before work every day. 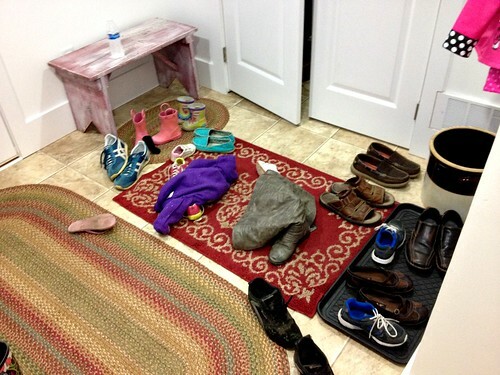 Is there a time that works for you (and your kids) do to a full-house pick-up each day? When you really take the time to think through this, you might be surprised how much margin time you might find each day — and how easily you can work a few home management tasks into those pockets of margin time. What are some of your daily home routines? What Should We Do In Our Bathroom? Great post! Thank you for that motivation! 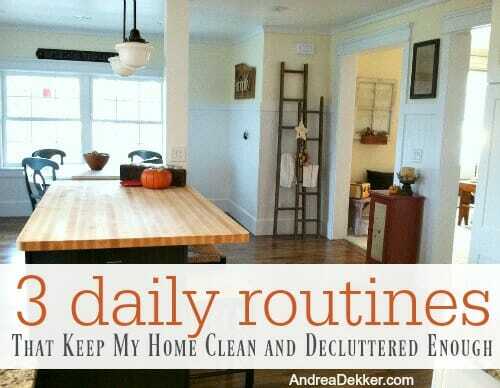 Andrea, I love that each of your daily routines includes making and cleaning up a meal. Planning and making meals for a family is so important! Thanks for encouraging and challenging us. And you set such a good example. 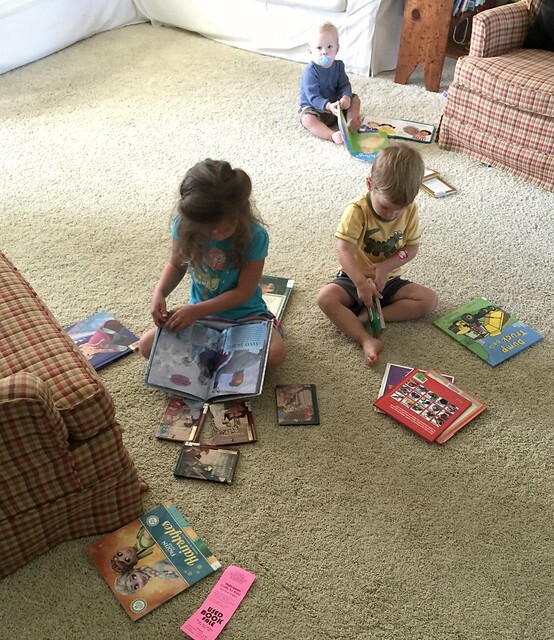 Love those pictures of your children reading contentedly at home. oh man — I can totally relate. Will your little guy tolerate being worn in a carrier? He likes the carrier if he’s ready to sleep. If he’s awake though, he tries to reach and grab whatever I’m doing–not so good if I’m chopping veggies or putting dirty dishes in the dishwasher! I do use it on my back sometimes if I get desperate. And lately I’ve been able to have him sit in his highchair for a few minutes with a snack for dinner prep. I’m trying to get better at quickly coming up with a routine to fit the new phase, and then quickly modifying it when it no longer works. I’m usually slow at that but trying to be more flexible does help! sounds like you are doing an amazing job! Keep it up — it WILL get easier! I love that you included “make my to-do list for the next day”. I sleep better when I know exactly what I need to tackle the following the day! ah yes — ALWAYS a to-do list for the next day! Love this post! Even though my life is in a completely different phase than yours (no kids or husband at home) I needed this. I have always known that if you just do a little bit here and there, you don’t need to spend a lot of time all at once. Now that mowing season is almost here, I need to get my inside routine down. Thanks for sharing Lynn — I always hope my tips can be applied to others in different seasons of life!